Somehow I missed doing an update on Chicago foreclosure activity in December but the story has been pretty repetitive anyway - so much so that Attom Data Solutions (the parent of RealtyTrac) now only releases their US Foreclosure Market Report once every quarter. Their year end report, released today, contains the graph below, which shows both the number of foreclosures and the foreclosure rate hitting 12 year lows. The decline has been steady since 2010. As you can see from my Chicago foreclosure activity graph below 2017 also hit a relative low point locally, though the month to month variations are significant. December had the lowest foreclosure activity level in 3 months although it was not the lowest level for the year. Nevertheless, the downward trend and year over year declines are clear. And, most importantly, defaults are running at the low end of the recent range. 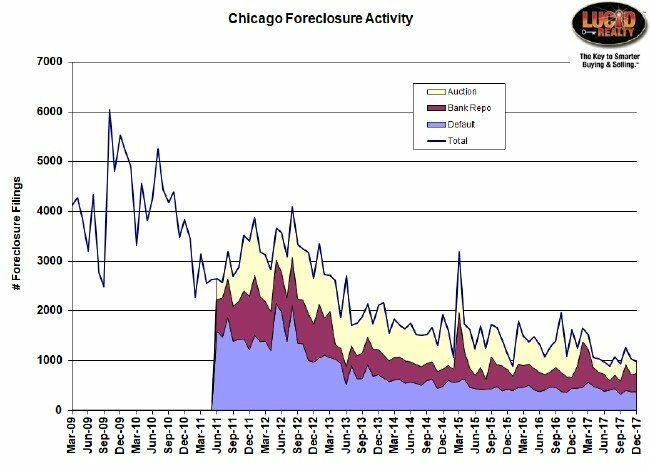 Chicago foreclosure activity has dramatically declined over the last few years. The Attom Data Solutions report made a few other observations about Chicago and Illinois. First, Chicago was among the top 10 metro areas in foreclosure rates in 2017 but that's not so bad as long as it represents concluding foreclosures instead of starting them. They didn't provide the data for Chicago but my own tracking of foreclosure starts (defaults) shows a significant decline. Unfortunately, Illinois was one of only 5 states that actually showed an increase (2%) in foreclosure starts during 2017. And, just as we are getting close to putting this foreclosure crisis behind us, the time required to complete the process continues to skyrocket - and we know Illinois is one of the worst states in this regard. It could be that what's left in the pipeline are the thorniest issues. The nation is currently at close to 3 years, which is just absurd. The time to foreclosure has steadily increased throughout the crisis. 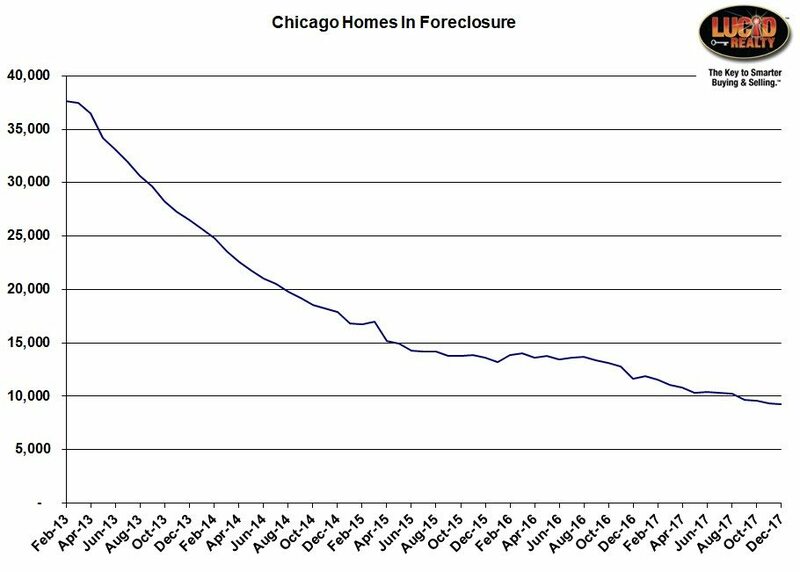 Fortunately, Chicago is making very nice progress in working through the backlog of foreclosures. There was a good size decline in November, followed by a more modest decline in December. This shadow inventory now sits at 9275 units - about one quarter of where it was when I started tracking this.